If you read this blog with any regularity you’ll probably notice I tend to talk about sublimation more than any other topic. There are a couple of reasons for that. One is simply that this blog is called SubliStuff, and so it stands to reason that we’ll discuss sublimation topics the most. Another is that sublimation is a versatile process, allowing you to decorate a wide variety of items. More options for decoration means more subjects for posts, and anyone who has ever tried to write anything knows more topics about which to write is always a good thing. Finally, we tend to talk about sublimation more because really there doesn’t appear, at first glance, to be much to say about ChromaBlast. You can use the ink to decorate cotton fabrics, the end. That doesn’t make for a very long post unless, of course, you dig a little deeper. The first thing you find when you dig deeper is the fact that cotton is one of the most popular fibers for clothing. Cotton is used for shirts, dresses, socks, almost any garment you can imagine. Since many people like the softness and breathability of cotton clothing, it also sells well. Even if you limited yourself to simply decorating cotton t-shirts, you’ll still have a product made of a fabric that people like to wear and use. The second thing to remember is this: should you choose to use ChromaBlast Ink, you aren’t necessarily limited to decorating simply t-shirts or even clothing There are also cotton hats, cotton tote bags, cotton fabrics for pillows and upholstery and more. From bed sheets to Christmas stockings to diapers, there are a large number of products made of cotton. A third thing to consider when considering ChromaBlast is that it offers a way to decorate cotton garments that generally has less barriers to entry than direct to garment printing. Back in May we did a post in which we compared ChromaBlast printing with other decoration options. In that post we discussed that fact that direct to garment printers tend to have more maintenance issues and that the cost is quite a bit higher than the cost of purchasing a ChromaBlast printing system. While direct to garment printing is a great choice for many people, it may not be the best choice for someone who is just starting out, or who only wants to decorate a limited number of garments. In the end, ChromaBlast can be a great choice and a useful addition to a garment decoration business. If you already do sublimation, ChromaBlast adds the option of decorating cotton garments. If you’re simply interested in decorating cotton fabrics, ChromaBlast is a less expensive and has less of a learning curve than other types of cotton decoration methods. EnMart’s Ricoh GX e3300N ChromaBlast package starts at only $419.00, which is a fairly minimal investment when it comes to garment decoration equipment. If you are interested in learning more about ChromaBlast Inks and the options they offer, please contact us. 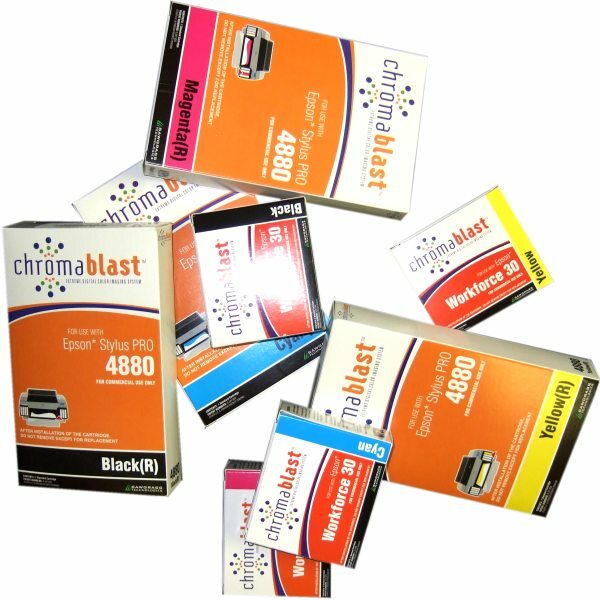 We’ll be happy to help you decide if ChromaBlast is the right choice for your business.